Braineaters’ Bloody Trampoline is an addictive and thoroughly silly app for your iPhone and iPod Touch. 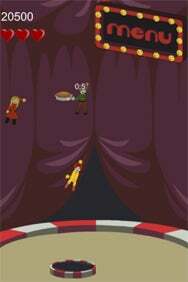 You're task is to bounce various characters and objects high above the center ring of a circus—the more you bounce the characters, the more points you'll get. With your fingers or accelerometer, you'll manipulate the tiny trampoline at the bottom of the screen so you can juggle various cartoonish characters and a random assortment of objects (like pies and axes). But beware: some objects you'll want to avoid (while others you'll want to save) and your mistakes can lead to a screen full of cartoonish pie or blood. Do you save the clown or the woman in the red dress? Bloody Trampoline’s circus milieu is fitting in more ways than one: the game often feels more like a juggling act than a trampoline routine. The game takes place in front of an unmoving backdrop of a purple circus tent and striped center ring. Each character or object has a distinct point value, which for me often determined who was saved and who was left to fall to their untimely end. Here's a hint: save the high-point-value characters. The rest are at the mercy of gravity. Bloody Trampoline first struck me as a flashier version of Brick Breaker, but after a few rounds, I came to realize that the horizontal movements of the trampoline is really all they have in common. This game could easily be mindless (and maybe even a touch boring) but the added twist of avoiding some falling objects kept me on my toes. For example, the plummeting axe cuts your score in half for five seconds, and accidentally bouncing the pie results in a splatter effect all over the screen, hindering vision for a few precious seconds. Another nice touch is that Bloody Trampoline gives players the option to control the movements of the trampoline by touch or accelerometer (personally, my scores ran higher with the touch option). The settings screen also features an option to display in-game help, which is really just a guide on which items to pick up or let fall. My only complaint about this game is that a round of it never seems to last very long. An unlucky squirt of blood or pie across the screen (or, in some cases, both at once, leaving you blind for a bit) is enough to end a round, and oftentimes, I found myself juggling so many characters at once, that they all bounced off of one another, making that round of play cluttered and confusing. However, the official Bloody Trampoline website boasts a high score of 73000, so clearly, longer gameplay is possible. What I really like about this game is its sense of humor. When you let a doll-like character fall, blood squirts across the screen, impairing vision temporarilty. Similarly, the characters have names like “Co-Worker” and “Suicidal Guy." Also, keep an eye out for a certain red-haired fast food clown donning a yellow jumpsuit. Bottom line: despite the crude animation and humor, Bloody Trampoline is an addictive and cheap thrill.